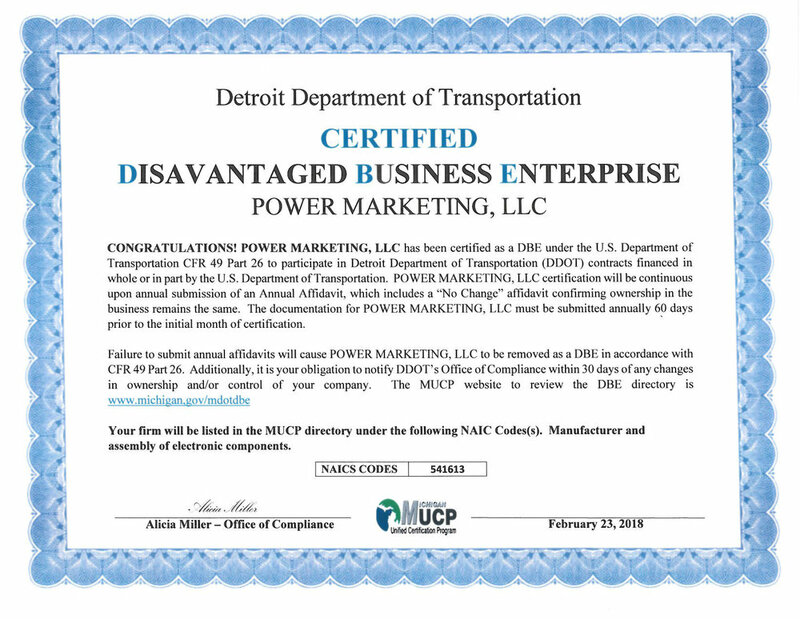 We are DBE certified by the U.S. Department of Transportation as a Disadvantaged Business Enterprise | Serving Ann Arbor, Detroit and Michigan and beyond. POWER MARKETING RESEARCH has been certified a WBE (Women's Business Enterprise) and a WOSB (Woman Owned Small Business). In order to have WBE certification, a business must be 51% or more woman-owned, controlled, operated and managed. To become certified as a WBE, a business goes through a rigorous evaluation process that includes an in-depth review and a site visit. Certification is performed by a third party, such as the Great Lakes Women’s Business Council. WBE certification is accepted by more than 1,000 corporations representing America's most prestigious brands. Using a WBE certified business can also help win more business for companies that aren’t woman-owned. Proposals which contain a WBE subcontractor are often given extra points during the evaluation process. Using a WBE can contribute to the overall proposal goals and help push you over the edge when a purchaser makes their decision. PMR has also been certified by the U.S. Department of Transportation as a DBE (Disadvantaged Business Enterprise) in Michigan. The DBE program ensures equal opportunity in transportation contracting markets, and promotes increased participation in Federally funded contracts by small, socially and economically disadvantaged businesses, including minority and women owned enterprises. The DBE certification helps Power Marketing Research more effectively participate in federally-funded transportation-related contracting opportunities. The certification also gives those in the public-sector an opportunity to conduct marketing research while collaborating with a DBE. Power Marketing Research has also been certified as a Small Business Enterprise (SBE) by the Wayne County Airport Authority. The focus of the SBE Program is to increase the number of small businesses certified in business categories. The Small Business Enterprise Program is designed to increase opportunities for qualified small businesses located within the Air Trade Area (Michigan counties of Genesee, Lapeer, Lenawee, Livingston, Macomb, Monroe, Oakland, St. Clair, Washtenaw, and Wayne) to participate in non-federally funded Airport Authority contracts. Power Marketing Research is also a 100% woman-owned corporation.